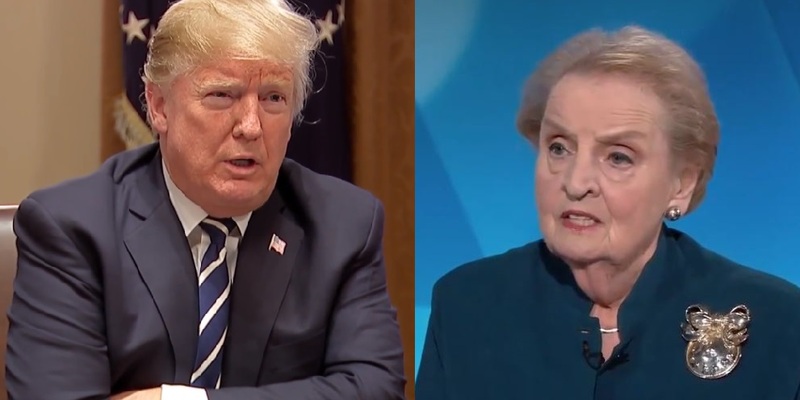 Albright, who worked on the National Security Council and as the U.S. ambassador to the U.N. before becoming secretary of state, slammed Trump’s treatment of U.S. allies last week at a NATO summit and the praise he gave Putin after their summit in Helsinki. Trump claimed that he misspoke when he said at a Monday news conference with Putin that he didn’t see any reason why Russia would meddle in the 2016 presidential election, despite the assessment of multiple U.S. intelligence agencies that it did. Trump told reporters on Tuesday that he meant to say that he didn’t see any reason why Russia “wouldn’t” interfere. “I think he must think we’re genuinely stupid because if one watched what he was doing in his press conference, he made it quite clear that he was believing Putin much more than his own people,” Albright said in response to Trump’s attempt to walk-back his earlier remarks. “I think that Russia is his friend and [he] only cares about collusion because he’s so uncertain about his own victory,” she added.